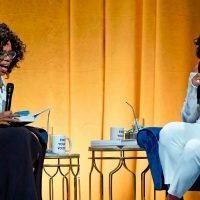 Since the launch of her autobiography, Becoming, Michelle Obama, 55, has been looking fabulous on her book tour. 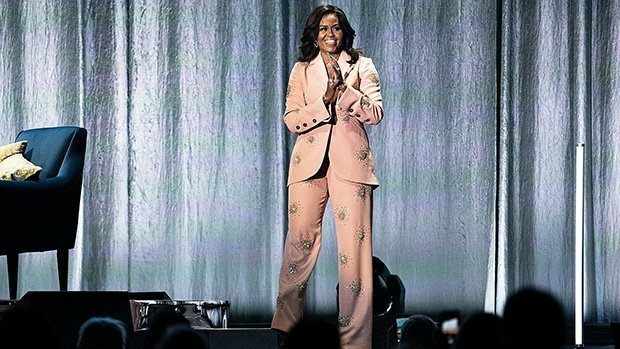 The latest stop on the former first lady’s promotional tour was in Cophenhagen, Denmark, on Tuesday, April 9, when Michelle opted to wear a millennial pink, two-piece Stine Goya suit. Never one to shy away from bold outfits, Michelle looked stunning in the pink $1,350 crystal-embellished Cady blazer from the brand, paired with the matching, $960 crystal-embellished Cady straight-leg pants. She opted to go shirtless underneath the blazer, which she kept buttoned up, pairing it with the high-waisted, fitted skinny leg trousers. The coolest part about the ensemble was that it was covered in burst of crystals, making her shine at every move she made. She topped her look off with gorgeous Jimmy Choo pumps. 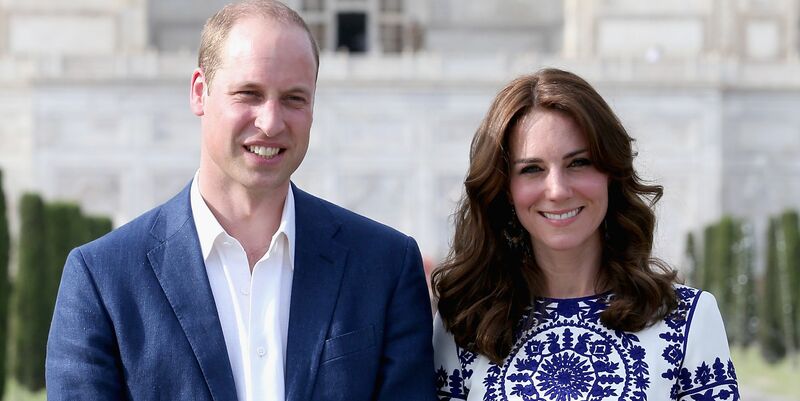 Aside from just looking fabulous in this ensemble, we love that fact that she chose to wear a Danish designer, as a nod to the country she was visiting. 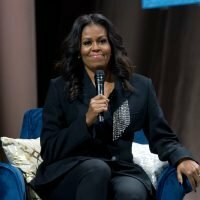 Michelle is very respectful of each city or place she stops in on her promotional tour, especially when she wore a matching black suit by Brooklyn designer, Pyer Moss for her stop in Brooklyn, New York back in December. 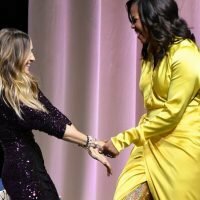 Meanwhile, on December 19, she had another book tour event in Brooklyn that made headlines, because Michelle arrived at the Barclay’s center in insane metallic gold thigh-high boots from Balenciaga that cost a whopping $4,000, while her yellow silk gown featuring a massive slit, was also by Balenciaga. Ever since Michelle blew us away with her stunning satin yellow gown, her book tour looks have calmed down a bit, but are still super stylish. One thing’s for sure about her outfits since then, is that she is loving the power suit and has worn multiple matching two-piece suits on the book tour, ever since. 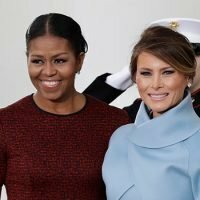 Michelle just gets it when it comes to fashion, and it’s perfect timing to rock a suit, especially a blazer, which is right on trend. 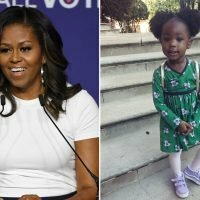 Blazers have been everywhere lately and celebs just can’t get enough of the transitional jacket, and apparently, neither can Michelle!